Tenkara Summit 2012 - Utah! The Tenkara Summit 2012 will be held in Utah during July 28 & 29th. I missed this year's summit but will not miss the next one! * Vendors may be available for sales of unique items. There will be more information and details around the program closer to the event. This is the link for the registration, it is advised to make advance plans for accommodation. After being banned to the indoor activities of fly fishing - fly tying, making lines, blogging, work on the man cave - I finally got a chance to head out for the first time in 5 weeks. Considering the flows of the local rivers and creeks, I opted to pay one final visit to Bear Creek before the year is over. Heading to the creek, I knew that flows having been moving daily from 10cfs to 20cfs and yesterday was no different. I got to the creek around 9.30ish and it the air was 42F, the creek was flowing at about 10cfs. Well, it was flowing alright but it was iced over in the slower sections (i.e. the slow deeper pools where I was expecting fish to hold). This makes it somewhat challenging to get the fly down to the fish, doesn't it? I took the temperature mid-day and the water was a chilly 36F, still. I decided to move around a bit and see if I can find any water that holds fish and is "mostly" ice free. I saw some nice trout, 14-16" in size, but unfortunately, they did see me as well and took cover (under the ice, that is). I took the opportunity also to test some lines, namely a new horse-hair line that I made a few weeks ago and a new hand-tied line of Tenkarabum. Both were made with the 11ft Iwana in mind that I fished with yesterday. The horse-hair line performed wonderfully, casting was a breeze (as long as there was no breeze!) and it would just lay-out perfectly. The hi-vis tip I added is a perfect addition, making it able to detect hesitations in the line just as well as with full hi-vis lines. Around mid-day the wind kicked-in considerable and I switched to a 11ft long, light, hand-tied line of Tenkarabum. I noticed that the line was definitively light and had much less "mass" than the horse-hair line. Initially, I had troubles adapting my casting stroke but eventually I figured it out. The line was a on the light side for the type of wind I experienced and I wish I would have brought my other lines, but alas, I decided to bring only those two lines and had to stick with it. I only brought one brown trout to hand, the only strike of the day (if floating ice does not count). 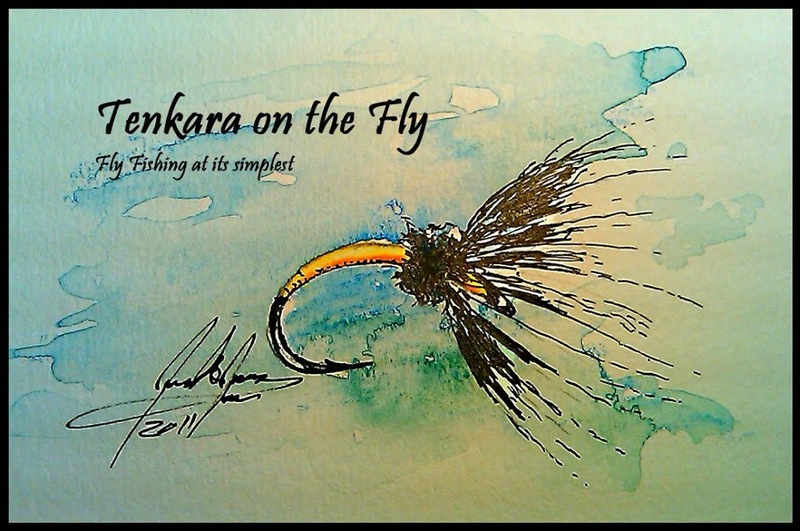 The fish took a sakasa kebari, a purple & snipe tied by Ashley of LearnTenkara. Overall, it was a beautiful day out on the water. By the time I left, around 3pm, the air has warmed-up to an almost balmy high 50ies.